And that’s why, if you are a keen English learner then idioms and phrases should be a part of your vocab. A silent or sleeping partner (in a company) is someone who is associated with the business through financial investments and shares the risks and rewards of it but, does not take an active part in the management and daily operations. • Over a three-year period, he recruited silent partners through newspaper adverts, promising to pay them ‘substantial returns’. Someone who helps a boxer to train for a fight by taking the part of an opponent. • Mike Tyson’s former sparring partner, Joe Egan, will also accompany him to New York. Someone with whom you have friendly arguments, (especially in politics). • When it comes to being a good sparring partner, David is the best. A person who cooperates in committing a crime or a deception is considered as your partner in crime. • When it comes to tax scams, I think all the businessmen and govt. officials become partners in crime. Someone who is one of a pair of people or things often associated or seen together OR good friends who get in trouble together. • My younger sister is my perfect partner in crime. It’s a partnership with no fixed term. It can (as the name suggests) be terminated by any of the two or more partners giving notice of termination. • Kunal is having a partnership at will in my company. To arrange things or people in groups of two i.e. to form pairs. • Please partner up with another student before starting the game. 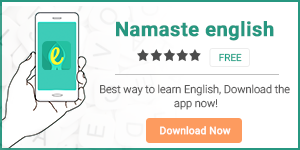 Don’t forget to download our English Learning apps Namaste English and HinKhoj. Next articleCountable and Uncountable Nouns: What are they?